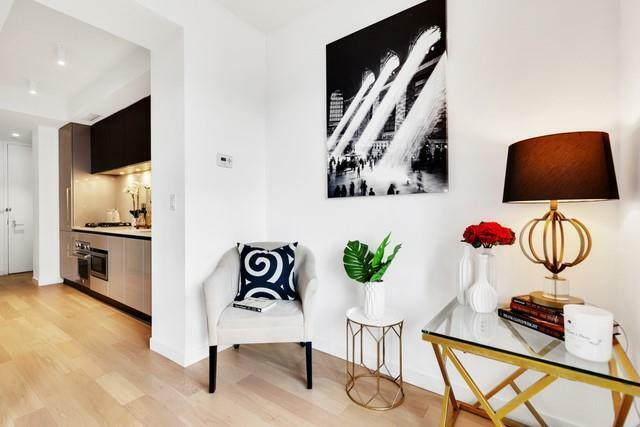 **New Construction**421A Tax Abatement**Possibility to Purchase Turn-Key Furnished**Residence 610-N is meticulously-designed alcove studio/junior 1 bedroom that is ready for immediate occupancy. This triple mint condo with low carrying costs is perfect for primary residency, pied-a-terre enjoyment or investment. This stunningly designed home with southern exposure is completely state-of-the-art and features ample living space with white oak hardwood flooring and a wall of floor-to-ceiling windows for ample natural light. 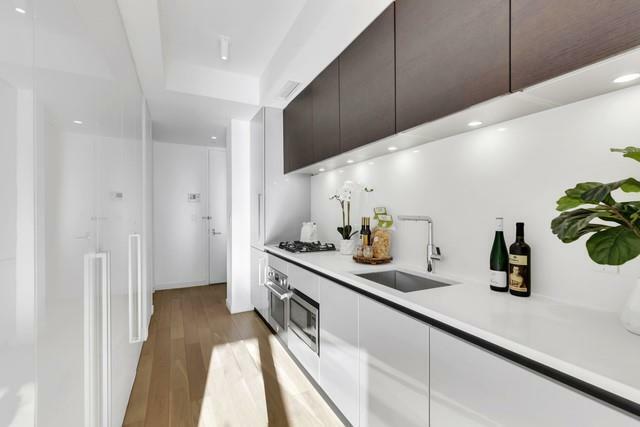 The sleek white kitchen features a Silverstone quartz countertops, imported Italian cabinetry, Bertazzoni gas range and oven, integrated ultra quiet dishwasher and integrated Liebherr refrigerator. The stunning spa bathroom features an enormous separate glass stall shower with handheld and rain-head shower fixtures, extra-wide floating sink vanity and imported Italian porcelain tile. Other features include individually-controlled central heating/cooling and walls of beautiful white lacquer closets in the entry foyer. A brand new stackable washer/dryer and custom electronic window treatments complete this amazing package. 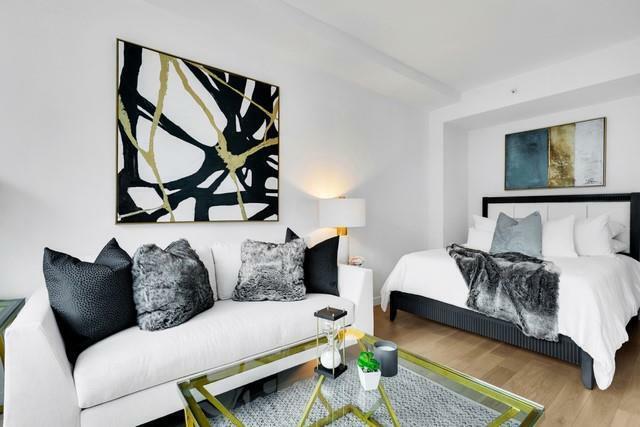 Situated in the heart of Midtown's Clinton District, better known as Hell's Kitchen, 540 WEST is a contemporary boutique condominium that was newly constructed and completed in Fall of 2015. The glass and steel facade reflect brownstones across 49th Street in a unique seven-floor, two-tower composition. The split-level lobby transitions into an open breezeway and central landscaped, 6,000 square foot courtyard with lounging, dining, open air movie viewing area and a reflection pool connecting the North and South towers. Lifestyle amenities include a 24-hour attended lobby with fireplace and intimate lounge, fully-equipped fitness center, bicycle storage, pet spa and two landscaped roof decks with panoramic skyline and river views in every direction. There is also a dedicated and attentive staff to facilitate everyday life including a full-time concierge and resident manager. The very best of Hells Kitchens restaurant and bar scene can be accessed all along nearby Ninth Avenue between 42nd-57th Streets. 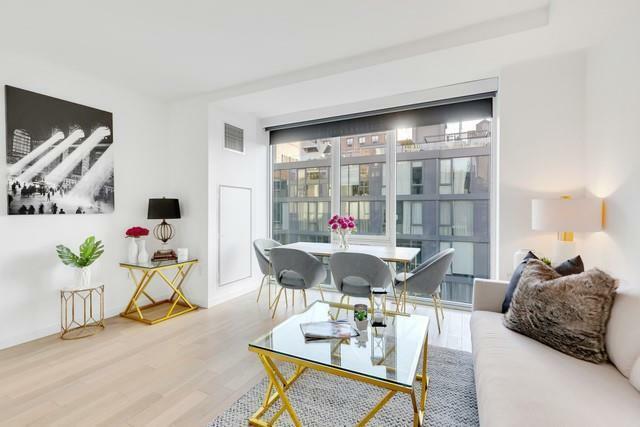 Other nearby conveniences include DAgostino, Amish Market, DeWitt Clinton Park and the C/E subway line on 50th Street and 8th Avenue for easy access to Chelsea, Downtown and the East Side on one line.